What is your favourite Rumi quote? ANdrew will offer a Rumi devotional workshop on Monday 13 May. See Program page for details and to book. 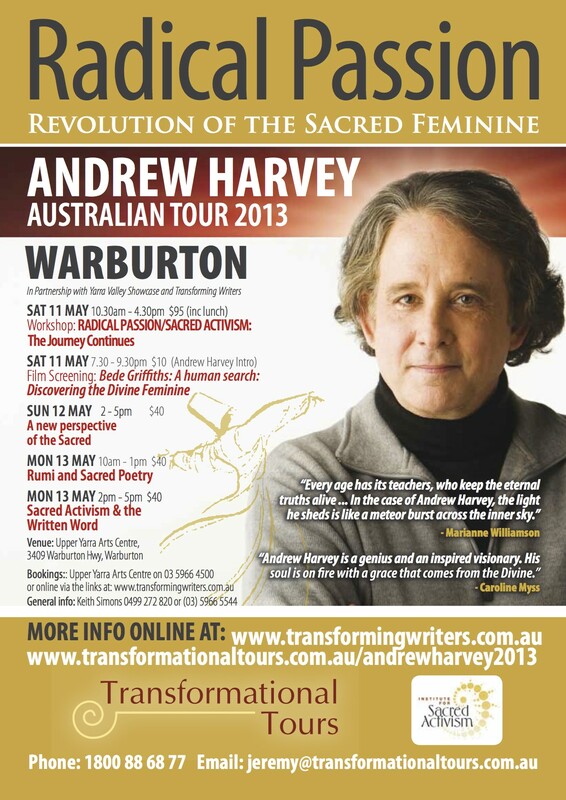 Here’s a quick link to the online booking service for Andrew Harvey. It’s wonderful to see so many people will be joining us! Here is the link to cut and paste in your browser, if needed. Here is the official event poster. We encourage you to print and share among your networks as appropriate. Thank you for supporting this event and the work of Andrew Harvey. We now have a gallery tab in the About section of our website. We’ll be adding lots of wonderful pics as the weekend takes shape! A taste from Murray Goodchild – his workshop ‘The rhythm of writing’ is Saturday 9 March at 10.30am. ‘Life’s great dramas are told in rhythms. The return of the tide, the passing of the seasons and the resurrection of spring flowers. Wise elders say that power moves in circles. As part of nature we are danced by the cycles and these are indicative of our own ability to transform. A powerful story harnesses the energy of rhythm and cycles to merge with the inner nature of the listener and guide them to an experience that leaves them forever altered. I feel deeply that we need a new type of universal language: a language that transcends surface differences and speaks to the heart of all beings. Transforming writers are evolutional pioneers in the quest to experiment, share and inspire others to discover the real inner voice. We need to create a new, unique culture, a new paradigm, a new collective sanity, and the ‘word’ as ensouled language is a vital part of this inner revolution. To change our world we must change ourselves and how we think, speak and write reflects our collective transforming stories and journeys. This ongoing series of events is in its early stages of organic growth. There is much important work to do to midwife it through, but the potential is exciting and inspiring. I propose ‘Friends of Transforming Writers’, those who are enthused by our vision and would like to help birth it. As a ‘not for profit’ group we cannot offer money but can offer free workshops. Naturally we would love locals to help create a Warburton that is perceived nationally and internationally as a Transformational event centre. Warburton is so ripe for this. Transforming Writers can be a major part of this. It would be great if someone could research and use Pozible as a way to raise funds. I want to acknowledge those locals who are interested or committed to offering workshops in our upcoming events, Maya Ward, Simon Oats, Murray Goodchild and my co-organisers Lindy Schneider and Leanne Simons. Keith’s workshop Transformational Writing is on Sunday 10 March at 2pm. Have we forgotten how to read slowly? Are we now so trained by our busyness and 140 character posts to read everything so quickly that we have lost the ability to read deeply, with presence and openness to juicy words that we can savour? For the past few weeks I have been working on a piece of nature writing that I wanted to enter into a competition just for the experience. I decided it was time to seek the wise counsel of a writing friend, someone I could trust for their clarity of vision and capacity for honest words. ‘I don’t think l like it,’ he says after the first read. ‘The alternating between personal biography and philosophy doesn’t work for me. Hmm, I think, surely biography is philosophy, and philosophy is biography if we are living authentically. I am going to read it again he promises. Half an hour later he texts: I’m experiencing it in a new way! I doubt that the competition judge will have the time to read my entry three times or from a space of ludicity when there is likely to be thousands of entries, but that does not concern me. The real reason one enters a competition is to learn something about the self and in the process, the writing way. In reflection, I also learnt how important it is to slow down and invite the reader to do the same. Who knows what jewels are hidden among the words we read or write when we take the time to let them shine? Stay with your words, and…create…the…spaces…within – spaces that have nothing to do with 140 characters!